"I recorded a couple of 4K video clips in AVC format. Undoubtedly, the quality is good. But the file size is sooo big. So, how can I compress those 4K AVC videos? It would be better if the quality could be maintained." AVC is exactly named MPEG-4 Part 10, Advanced Video Coding (MPEG-4), and also known as H.264. Although some more efficient video compression standards (e.g. HEVC/H.265) have caused a stir in the digital industry in recent years, AVC/H.264 is still the most popular format for the recording, compression and distribution of video content. Apart from SD/HD videos, AVC can also be used for ultra HD 4K and 8K content. Currently there're tons of devices that support recording 4K videos in AVC/H.264, for example DJI Phantom 3, iPhone (from SE to X model), and GoPro HERO 5. Encoding 4K videos to AVC/H.264 can achieve a good compatibility with the devices and programs in the market, but will deliver super large files. For example, shooting a 60-second 4K AVC video at 24FPS with an iPhone will eat up 270MB. The file size is pretty large, right? You'll find that your storage device or service will run out of space quickly because of the existence of 4K AVC/H.264 videos. So, how can we compress 4K AVC videos? First of all, you need to download a 4K AVC video compressor. 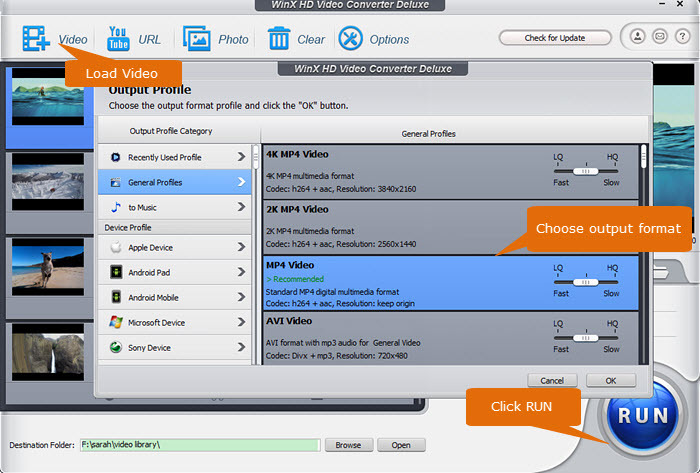 WinX HD Video Converter Deluxe - a handy tool offering multiple ways to shrink 4K AVC videos. 1). Convert 4K videos from AVC/H.264 to HEVC/H.265 which can reduce a half of file size without quality loss. 2). Reduce 4K AVC videos by trimming off unwanted segment, cropping out useless frame like black borders. 3). Compress 4K to 1080p video, lower video audio parameters, such as bit rate. Highlight: Uniquely supporting Intel QSV, NVIDIA CUDA/NVENC and AMD based level-3 hardware acceleration (hardware decoding, processing, and encoding), it outputs compressed 4K videos quickly while producing optimal video quality and file size. How to Compress 4K AVC Videos with WinX HD Video Converter Deluxe? HEVC, also known as H.265, is the successor to AVC/H.264. Superior to AVC, HEVC delivers the same level of video quality in half file size. Owing to this advantage, there're an increasing number of devices and programs adding the support for HEVC. So don't worry about the HEVC compatibility so much. Learn the steps below and convert 4K AVC to 4K HEVC for video compression without degrading quality. Step 1. Download and install WinX HD Video Converter Deluxe. 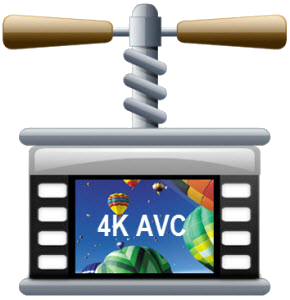 Launch this program once done, choose Video to enter into Video Converter, and then click +Video button in the screen to load the 4K AVC videos you need to compress. Step 2. From the Popular tab at the bottom of the screen, choose MP4 HEVC profile. To speed up video decoding, processing and encoding, you're suggested to use hardware acceleration. WinX HD Video Converter Deluxe will enable it automatically if your GPU supports Intel QSV, NVIDIA CUDA/NVENC or AMD hardware acceleration technologies. Step 3. Hit the blue RUN button to begin compressing 4K AVC/H.264 to 4K HEVC/H.265 without quality loss. 4K undoubtedly looks sharper than lower resolutions. But if you play 4K videos on small display, your eyes won't be able to tell the difference between 4K and a slightly lower resolution, say 1080P. And sometimes there's no strict requirement regarding resolution. In such cases, simply reduce the resolution of your 4K AVC videos, 4K to 1080P for instance. Step 1. 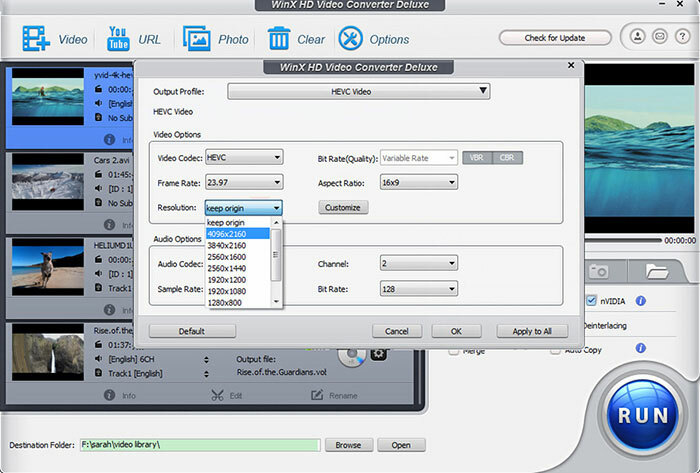 Click the +Video button of WinX HD Video Converter Deluxe to import source 4K 2160P AVC videos. Step 2. Choose your desired output format. You can choose one from the presets at the bottom or click Target Format to get more choices. You can choose one same to the original or one with different codecs. Step 3. Click the Option icon, and then click the drop-down menu of Resolution to select the resolution (i.e. 1920x1080) you want. Alternatively, press Custom button to manually input the values of width and height pixels. Other parameters are also adjustable. Be careful when tweaking them. Step 4. Hit RUN to begin compressing 4K AVC videos to smaller resolution. Hardware acceleration is also available to choose before pressing RUN. Aside from speedup, it also plays a big role in enhancing the video quality. It is common to find that there're some unwanted parts in our 4K AVC video recordings. Trimming/cropping them off can not only make our works better, but also reduce the file size efficiently. Step 1. As before, we need to download and install WinX HD Video Converter Deluxe. Then, open WinX HD Video Converter Deluxec, access Video Converter, and input the target 4K AVC videos by clicking +Video button. Step 2. You'll also need to choose an output profile based on your own needs. Step 3. Click Cut and Crop buttons to access video trimming and cropping windows. 1. Click Cut button under the pending file. 2. Drag the green knobs under preview window to set the start time and end time. 3. Click the orange Cut button and you will get clip 1. Click Edit if you need to change the time points. 4. Once finished, click Done. 1. Navigate to Crop tab. 2. Click Enable Crop button. 3. Type in values into the boxes of Left, Width, Top and Height, or drag the border in the preview window. 4. Click Done when completed. Step 4. Click the RUN button and wait for a while to get the trimmed/cropped 4K AVC videos. In addition to compressing (HD/4K/8K) videos, WinX HD Video Converter Deluxe can also fast convert video from A to B, convert DVDs to digital files, download HD/4K/8K videos and hi-fi music online, record screen and webcam, etc.